We are huge peach fans at my house, so it’s always exciting when peach season rolls around and we can once again get our hands on some juicy, ripe ones! I think it’s hard to beat just eating a fresh peach by itself or adding it as a topping on my morning granola cereal, but this year I just couldn’t stop there. After first trying it at a friend’s house, I had to experiment with putting peaches on the grill. 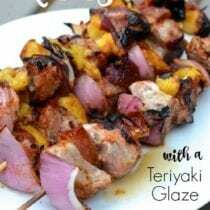 The outcome – these Pork and Peach Kabobs – turned out to be a huge hit, and, even if peaches aren’t yet available where you live, this simple teriyaki glaze would be fabulous just on the pork or almost anything else you want to throw on the grill. Enjoy! Cut the tenderloin into 1 - 1 ½-inch chunks. Cut each peach in half, discard pit, and cut into 5 or 6 slices each. Cut the onion into 1 - 1 ½-inch square pieces. Thread onto skewers, alternating ingredients to make 4 or 5 mixed kabobs. For mine, I did two sets of pork and peach for every piece of onion. In a small sauté pan over medium heat, melt the butter. Whisk in the flour and cook for 1 - 2 minutes until it darkens in color but does not burn. Whisk in the rest of the glaze ingredients and cook at a light boil while stirring occasionally until the mixture thickens enough to lightly coat a spoon, 5 - 10 minutes. Remove from heat. Preheat a gas grill to medium-high heat, around 425° F (or prepare a charcoal fire), and place the skewers on the grill. 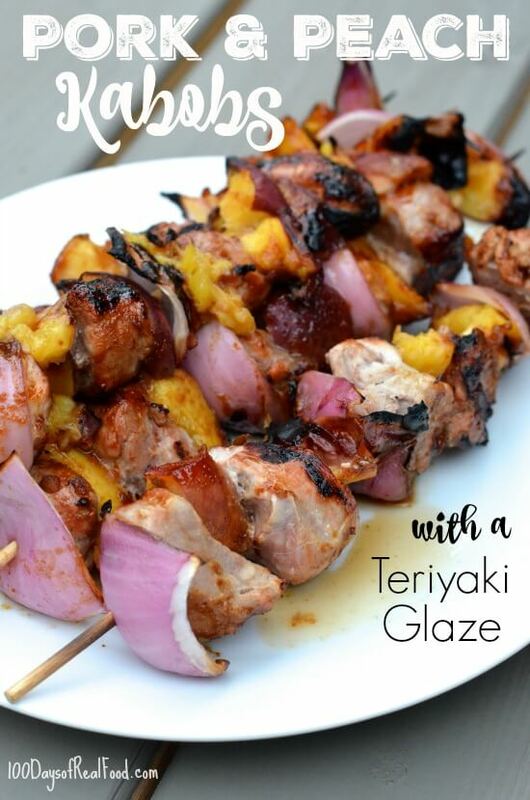 Drizzle half the glaze over top of the skewers and cook for 5 - 6 minutes. Turn the skewers over, pour the remaining glaze on top, and cook until the pork is done (no longer pink in the middle), another 5 - 6 minutes. Serve warm with a big green salad and brown rice on the side. 1. Will also need 4 skewers. 2. If the glaze is cooled in the refrigerator, it will thicken even more. 3. We recommend organic ingredients when feasible. Ready to go on the grill! These look really good. I might try them with pineapple or apricots as peaches aren’t in season here yet. 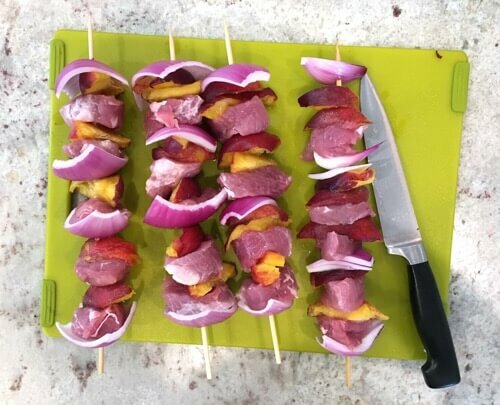 We are big kebabs on the grill fans, but I never tried with peaches. They don’t fall off? Good idea! Sounds delicious. Why tenderloin and not loin? Just personal preference. Sirloin is fine, too. do you peel the peaches before grilling them? Could I substitute another flour to make it gluten free? (with coconut aminos) Like almond or coconut flour??? Hi Sarah. We have not tried but I think it would work. Let us know if you give it a go. Could corn starch be subbed for the flour to make it gluten free? While not an ingredient we’ve used, I do think it should work. These look fabulous!! Trying for sure! If I can’t grill them, can I bake them instead? If yes then do you know at what temperature and for how long? Hi Mimi. You might look at this recipe for a time and temp reference: http://allrecipes.com/recipe/228872/oven-baked-chicken-teriyaki/. Can I use another oil in place of the sesame oil because we have a sesame allergy. Thanks! You can use another oil that will work for you. Maybe peanut? I made this for a large crowd and 4xs the marinade recipe. Ended up having leftover marinade and used it with boneless skinless chicken breasts on kabobs. It was great on chicken too! Served over baked brown ripe. Yummy! Thanks for another great recipe. Oh and loved the peaches though we’ve now found it easier to not put with the meat when grilling. Just halve them and throw directly on the grill. I saw on Facebook that you served cocktails with this recipe. You’ve been posting a lot more “treats” lately (at least on FB), you used to seem much stricter. Wondering purely out of curiosity if you’ve modified your food rules a bit? And if so, how and why? Thanks! What do you usually serve this with? Have you ever froze this? eaten the next day but you could certainly freeze them. Could I broil this in the oven? Would the time be the same? Colorado peaches are in season and this seems like another great way to enjoy them but our grill isn’t working.